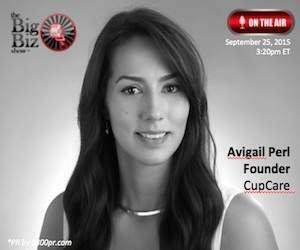 CupCare Founder, Avigail Perl to Be Interviewed on "The Big Biz Show"
The Big Biz Show is a nationally syndicated radio / television program broadcast on 150 stations throughout the country with a weekly reach of 1.7 million listeners reaching over 70 million homes. The Emmy Award winning show was named by TALKERS Magazine as one of the "Top 10 Most Influential Financial Shows" in the country is highly recognized for discussing current business events, internet related issues, and other hot topics in the business world, doing so in an informing, laid back, and humorous manner. Hosts, Bob "Sully" Sullivan and Russ "T Nailz" Stolnack; both are renowned and experienced radio broadcast personalities. The Big Biz Show airs Tuesday through Friday, 12:00 p.m. to 1:00 p.m. PT. Avigail Perl is the founder and CEO of CupCare, a feminine consumer goods company providing innovative hygienic beauty solutions for women. Perl came up with the idea of placing a disposable liner inside a bra when experiencing discomfort and frustration from her own bras. After going through different phases of prototypes and several rounds of beta testing, a specialized manufacturing line is in place at a state of the art facility. The CupCare liners will be available later this year.